When storing your most precious of memories from pregnancy, those heady newborn days, or even that impressive photo series you’ve made of baby’s first year – not just any old box will do. Nope, you need a box as special as your memories and this embossed beauty from Write To Me is a superb choice. Earlier this year we brought to your attention the glorious Write To Me Baby Journal. Now from the same team who are passionate about sentiment, we bring you the Baby Keepsake Box. 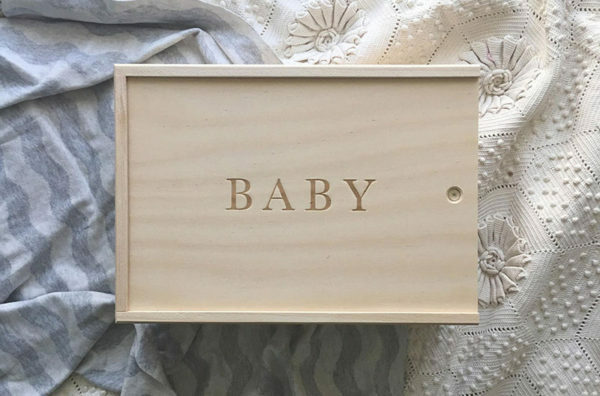 Handmade locally in Melbourne from durable pine wood, the Baby Keepsake Box is designed to securely store all of your precious memories and trinkets. There’s plenty of room in here for hospital tags, photos, baby books, even your favourite – albeit outgrown – outfit. A stunning gift for new parents, order the Baby Keepsake Box direct from Write To Me, priced $79.95.